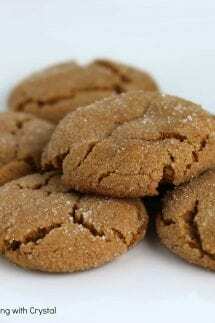 These delicious Ginger Cookies will not only make your tummy happy, but they will make your house smell delicious! Preheat oven to 350 Line cookie sheets with parchment paper or nonstick baking mats. Use an electric mixer at low speed to cream shortening and sugar until thoroughly combined. baking soda, cinnamon, ginger, cloves, and salt and add to the mixture. Roll them in sugar. Place 1 ½ inches apart. Flatten slightly with fingertips. Bake for 12 minutes. Cool on wire racks. Store in resealable plastic bags.